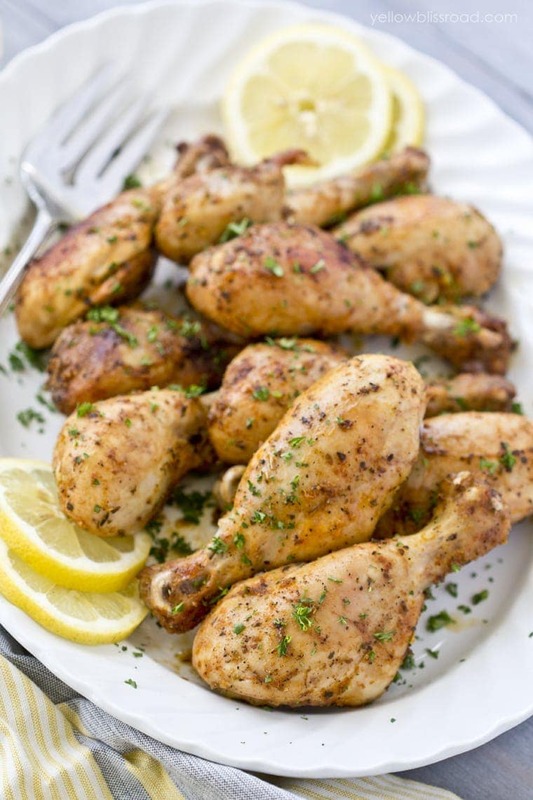 It doesn’t get much easier than these savory Lemon Garlic Roasted Chicken Drumsticks. 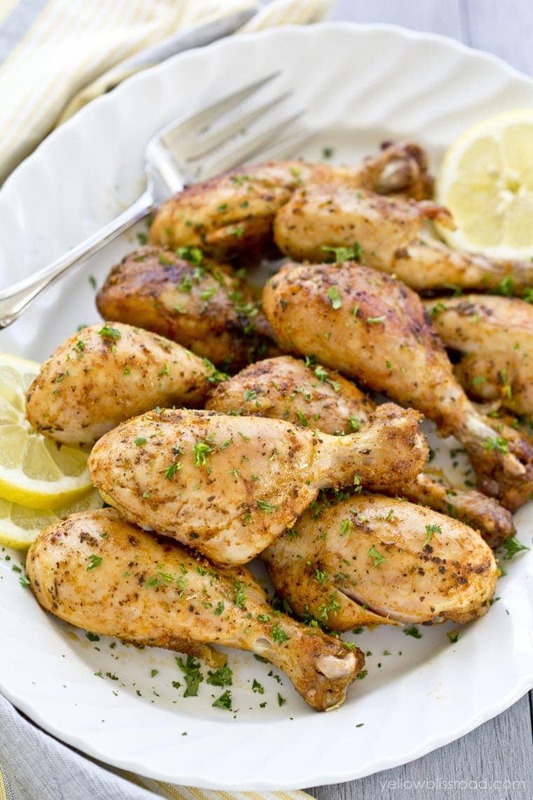 They are full of lemon and herb flavor and practically fall off the bone tender and juicy. Most of my life I’ve been a boneless, skinless white meat kind of girl. I think it’s because meat on the bone freaks me out. But in the past couple of years I have learned to appreciate the flavor packed bone-in dark meat of the thigh and drumstick. That’s probably because my son is pretty much obsessed with chicken on the bone. Upon hearing that dinner is “chicken again? ?” his next question is, “Wait. Is it on the bone?” A “yes” is met with a cheer while a “nope, sorry” is met with a rather impressive groan. So I’ve been trying to constantly come up with new ways to serve this favorite meat. 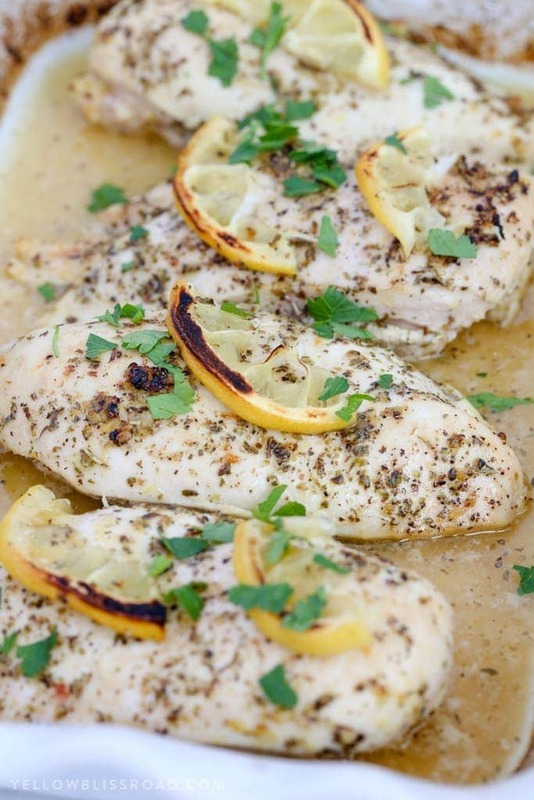 Our latest favorite is this Roasted Lemon Chicken. An overnight marinade makes this chicken practically fall off the bone tender, however if you don’t have overnight, you could go 30 minutes. Just remember that the longer it marinates, the more tender it will be. 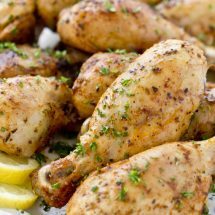 I have a lemon tree, so lemons are readily available all year round for us so I love to use them in my chicken recipes. The lemon flavor is so subtle and doesn’t overpower the rest of the marinade, which, in case you were wondering, is olive oil, salt and pepper, oregano and paprika. I am also a little obsessed with chopped parsley, partly for the fresh herbiness (yup, totally a word) and partly because it just looks so darn pretty. 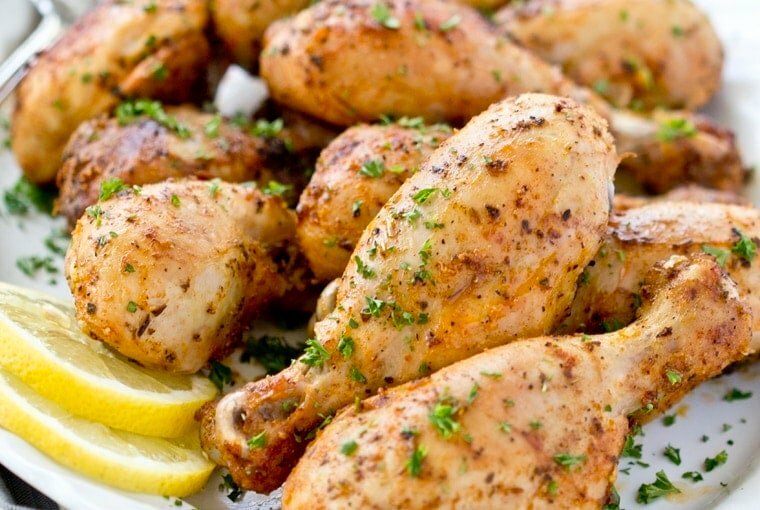 It doesn't get much easier than these savory Roasted Lemon Chicken Drumsticks. 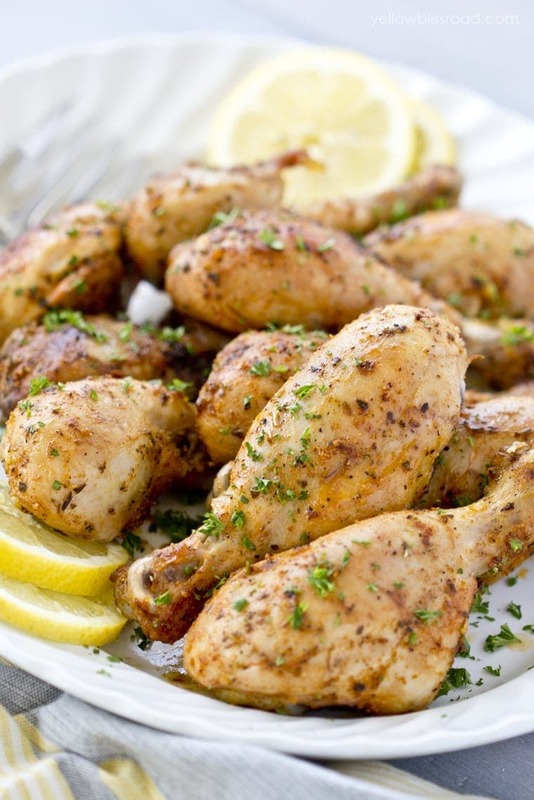 They are full of lemon and herb flavor and practically fall off the bone tender and juicy. Pat chicken dry and place into a 1-gallon Ziploc bag. In a small bowl, whisk together remaining ingredients. Pour over chicken and seal the bag, squeezing out as much air as possible. Massage marinade into the chicken. Refrigerate for at least 2 hours, or preferably overnight. (If all you have is 30 minutes, that's fine - just remember the longer the marinade time, the more tender and juicy the chicken). When ready to cook, let chicken come to room temperature (about 20 minutes). Preheat oven to 425 degrees. Arrange chicken on a foil lined baking sheet. Bake, uncovered, for about 20-25 minutes. Flip chicken pieces and cook another 10 minutes, or until chicken reaches an internal temp of 165 F and is no longer pink. Hi Kristin, Havemade this several times and love it. Can you freeze the chicken in the marinade, will it still be good? You can freeze the raw chicken in the marinade, yes. It will marinate as it defrosts in the fridge. Hi! I love this recipe! With it being so nice out now, can you throw these on the grill instead? A delightful chicken dish made quickly. Thank you j05h! and thanks for sharing your experience. I have made these twice now and both times they have been so full of flavor and falling off the bone. Wonderful dinner recipe! Thank you Julie for sharing your positive experience. So simple and super delicious! Thank you Diane! and thanks for stopping by. I USED your marinade to make fried chicken and it was awesome! And i added smoked paprika and salt & pepper, mccormick roasted garlic &herbs to the flour. Thank yu so much Ricardo! I love that you used the marinade for fried chicken!! This is my go to meal now. I use chicken breasts for more meat and lowered the oven temperature due to the burning point of olive oil being so low but oh my word is this delicious. I literally moan while I’m eating it. Hahaha. Highly recommended. (I found that marinating overnight provides more tender and juicy chicken but I’ve done only 2 hours as well and it’s still fantastic). great recipe but i so wish people would stop using plastic bags for marinating. whats wrong with marinating in a dish or tray? 1. It keep the marinade circulating around all of the meat. 2. It’s sealed so you don’t have to worry about the aromas affecting any other food in your fridge. 3. It’s my preference because it’s easier and doesn’t create another dish that has to be washed. You are welcome to use any method you like to marinate your meat. This is my preferred method and the one I recommend. Made these for dinner last night and they were amazing! I marinated them for about 3 hours and roasted as directed. They were tender and juicy with a fresh lemon flavor. Thank you for this recipe. It made me like drumsticks again. Could you do this with chicken breasts or tenders? You could, but don’t marinate more than 30 minutes and cook for a shorter amount of time, depending on the size of the pieces. Delicious! Thank you for the recipe. I made this with thighs rather than drumsticks. Worked out wonderfully. So moist & juicy. It’s a keeper! I absolutely LOVED this dinner however there is major debate on heating olive oil. EVOO is likely unsafe above 300 degrees so putting it in the oven at 400 or higher kills the good stuff in the oil and creates carcinogens. I”m back and forth on whether I will use olive oil on this again but the recipe itself was amazing. I’ve already raved to everyone. Thank you Terri! and thanks for sharing your feedback! Tried this tonight and it was flavorful. I marinated for 24 hours and baked it for about 35 min which was not enough. The meat thermometer was off tonight but aside from not fully cooking the drumsticks (user error) the flavor was a big hit with the family. It has officially been added to the dinner rotation. Thanks for the recipe. Hi Simsai, so happy that you and your family loved this recipe! Sorry, forgot to star-rate it … made this recipe as-is … soooo delish! Lemony and yummy!!! Thank you Kate! and thank you for the five star rating rating!